Resurge ultrasonic cleaners offer optimal instrument cleaning management. 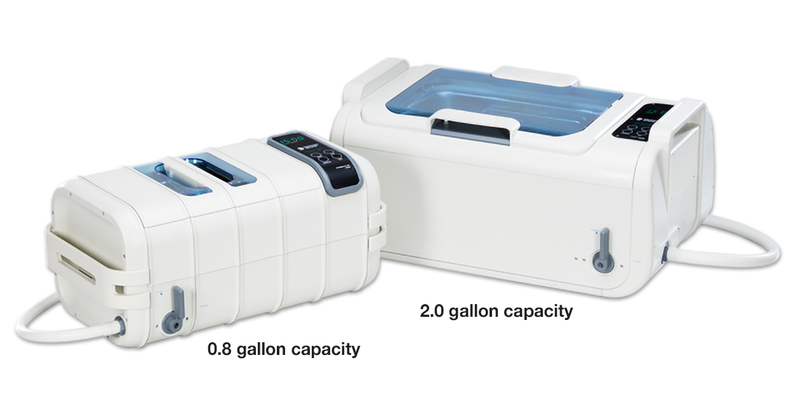 The 0.8 gallon unit is a low capacity cleaner that is ideal for small dental practices with 1-2 dentists while the 2.0 gallon model is a high capacity cleaner that is designed for a larger practice. Low profile design with a lid holder makes it easy to see into and remove instruments. Fits readily onto the sterilization center counter. Simple drainage system and flexible hose to easily change water and cleaner between cycles. Ceramic heater underneath the bottom of the tank provides safe and even heat distribution. Timer memory eliminates the need to reset timer each cycle. Universal stainless steel rack offers the flexibility of using the low profile tray, instrument basket or cassettes, for optimal instrument cleaning management. Includes: stainless steel basket, universal rack, power cord, drainage hose. Tank size: L9.8” x W6.9” x H3.1”. Includes: stainless steel basket, universal rack, power cord, drainage hose. Tank size: H13” x W9.4” x H4.1”.